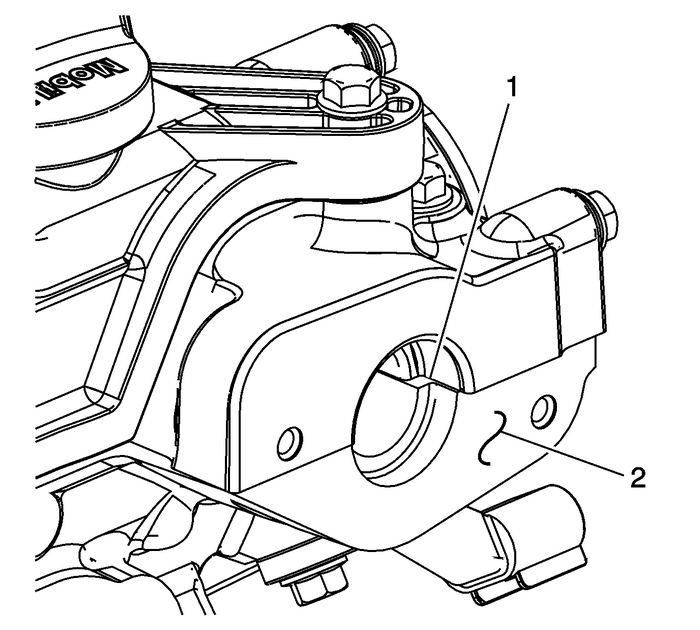 Install the hydraulic lash adjusters into their bores in thecylinder head and lubricate. Refer toAdhesives, Fluids, Lubricants, and Sealers. Lubricate the valve tips. Refer toAdhesives, Fluids, Lubricants, and Sealers. 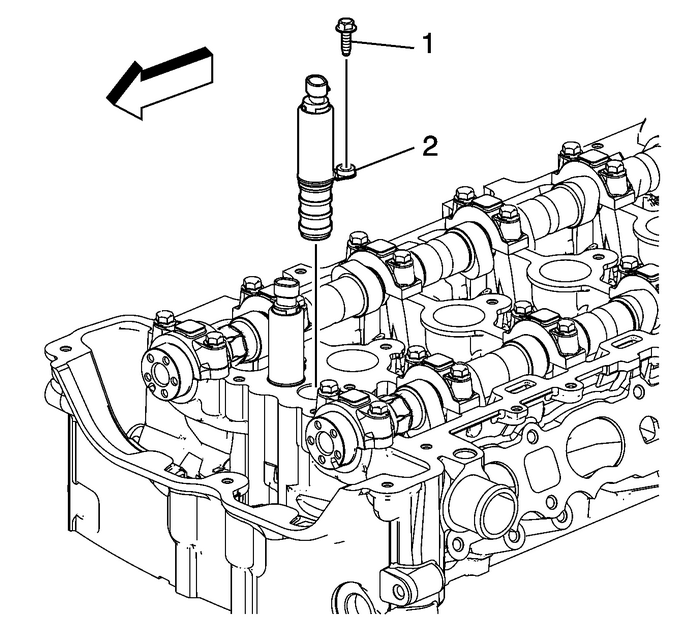 Note:Used roller followers must be returned to the originalposition on the camshaft. 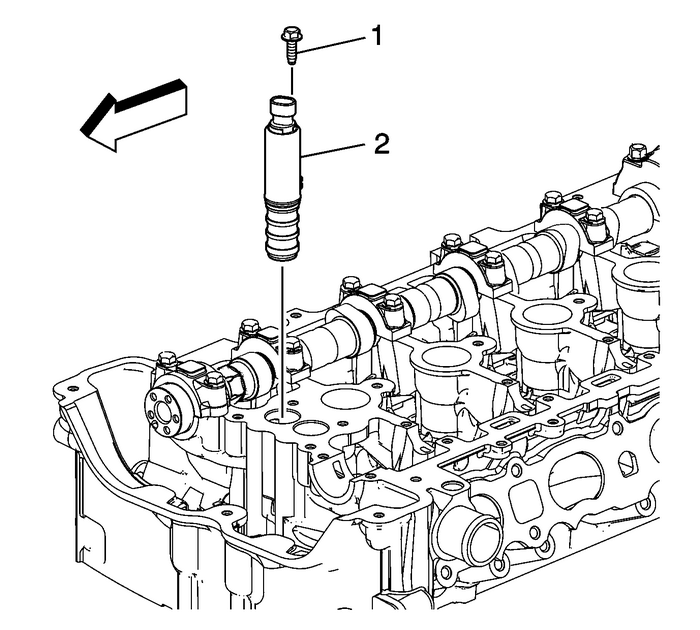 If the camshaft is being replaced, theroller followers actuated by the camshaft must also bereplaced. Position the roller followers on the tip of the valve stemand on the lash adjuster and lubricate. Refer toAdhesives, Fluids, Lubricants, and Sealers. 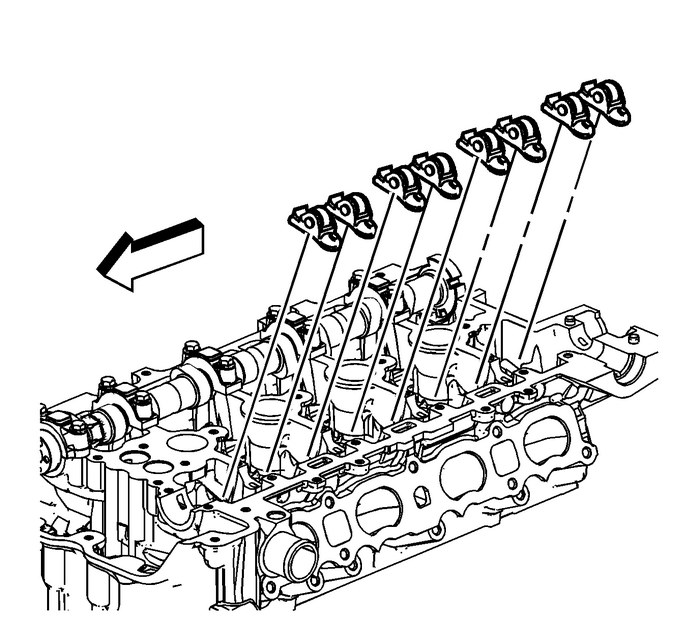 When installing the camshafts, ensure the intake camshaftnotch is in the 10-o'clock position-(2) andthe exhaust camshaft notch is in the 7-o'clockposition-(1). The number 1-piston should beat top dead center-(TDC), crankshaft key at12-o'clock. Set the exhaust camshaft on top of the roller followers inthe camshaft bearing journals and lubricate. Refer toAdhesives, Fluids, Lubricants, and Sealers. 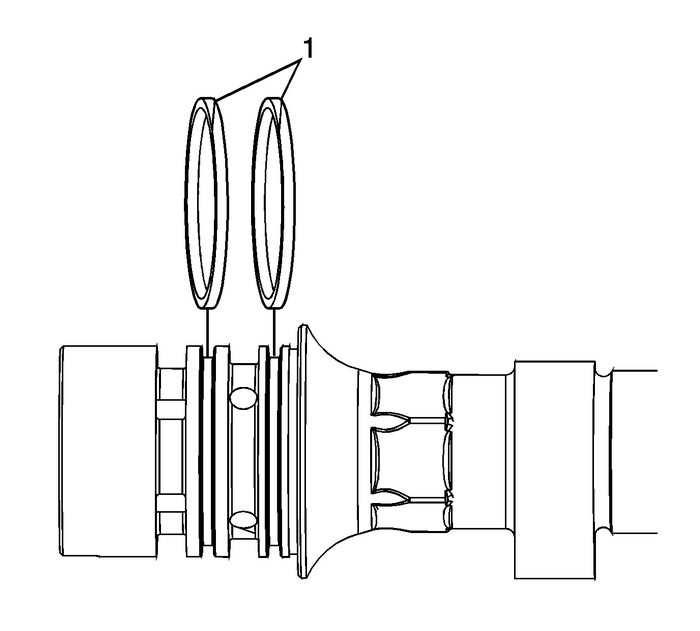 Rotate the oil seal in the groove of the number one camshaftjournal so the split line-(1) is at approximately the12:00 position before installing the camshaft caps. 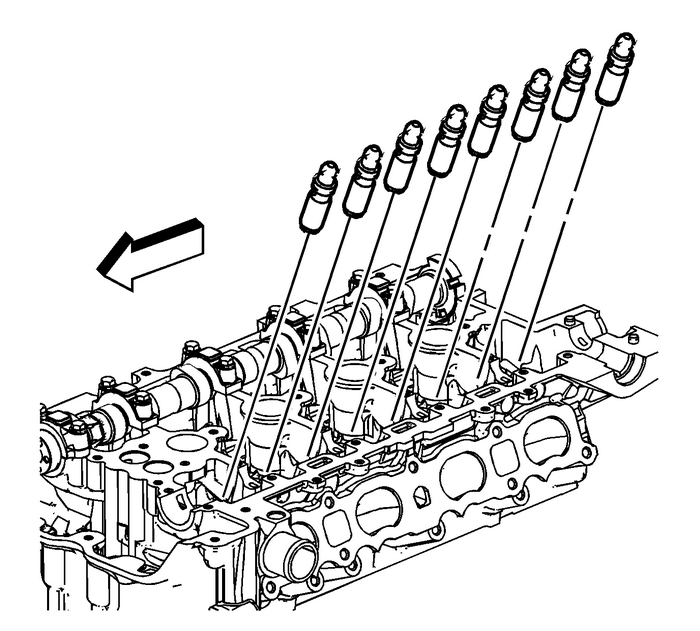 Install the exhaust camshaft with the notch on thefront-(1) at approximately the 7 o'clockposition.Install the camshaft caps and hand start the camshaft capbolts. 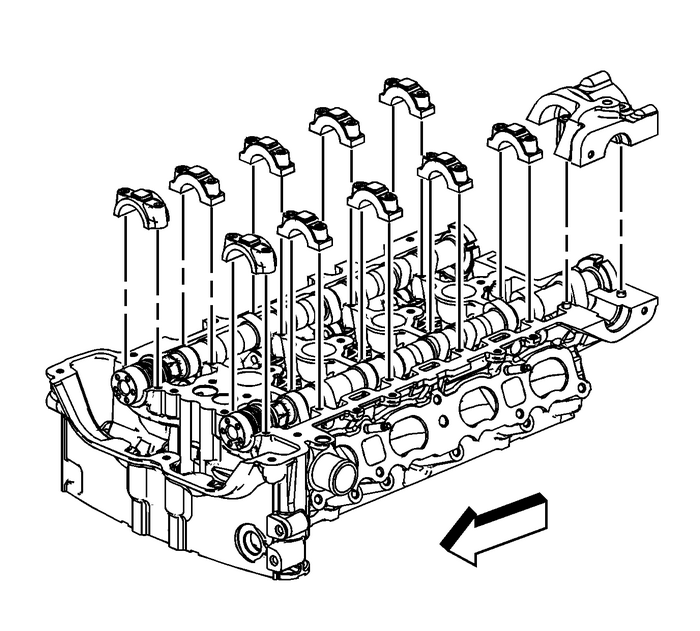 Tighten the camshaft cap bolts in increments of3-turns until they are seated. Tighten the camshaft capsto10-Y-(89-lb-in). 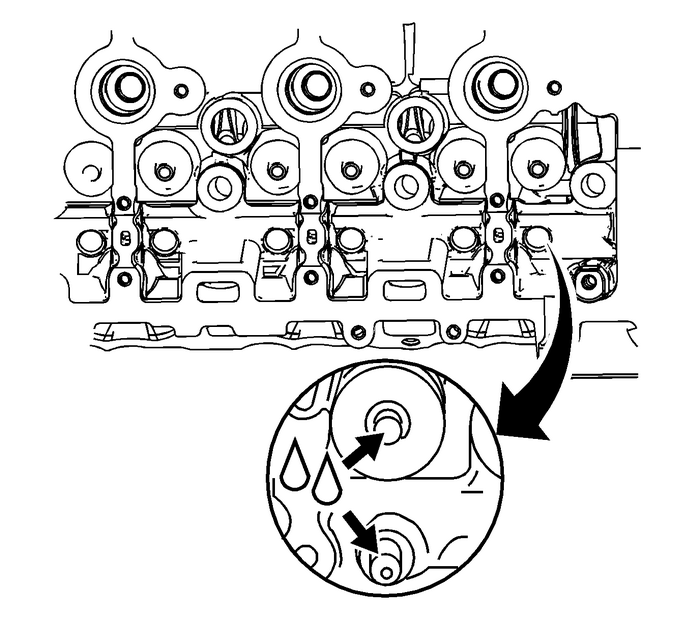 Install the hydraulic lash adjusters into their bores in thecylinder head.Lubricate the hydraulic lash adjusters. Refer toAdhesives, Fluids, Lubricants, and Sealers. Position the roller followers on the tip of the valve stemand on the lash adjuster. Lubricate roller followers. Refer toAdhesives, Fluids, Lubricants, and Sealers. 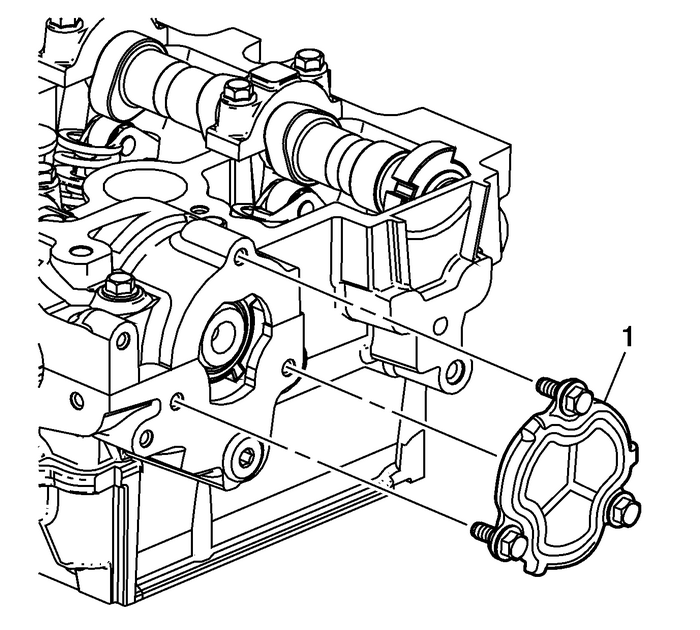 Set the intake camshaft on top of the roller followers in thecamshaft bearing journals and lubricate. Refer toAdhesives, Fluids, Lubricants, and Sealers. 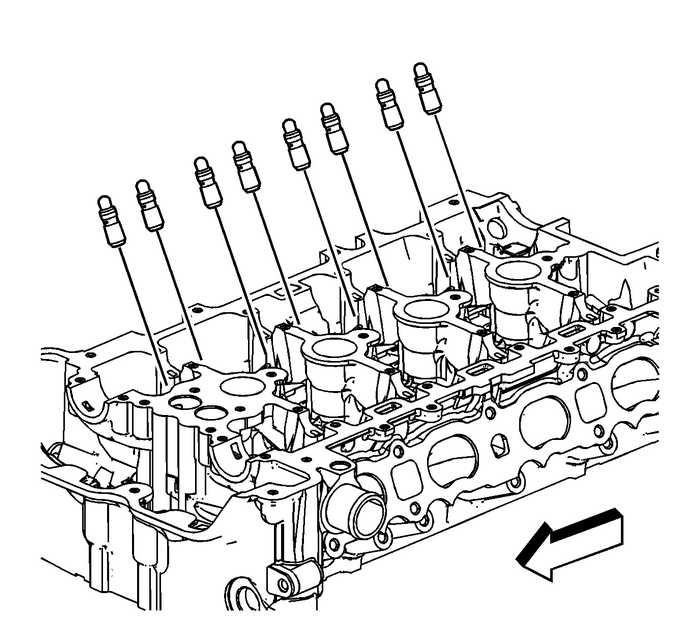 Note:The number 1 cylinder must be at top deadcenter-(TDC), crankshaft keyway at the 12 o'clockposition. 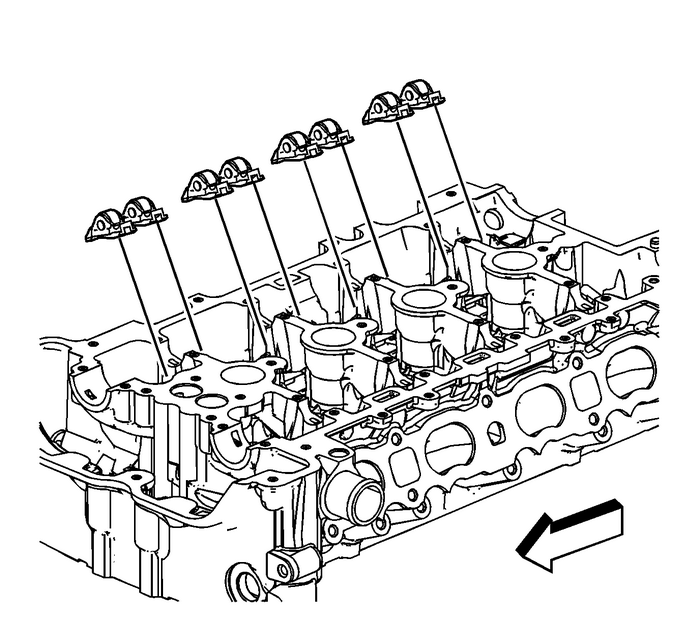 Install the intake camshaft with the notch on the front atapproximately the 10 o'clock position-(2).Install the camshaft caps and hand start the camshaft capbolts.Tighten the camshaft cap bolts in increments of3-turns until they are seated. Tighten the camshaft capsto10-Y-(89-lb-in). 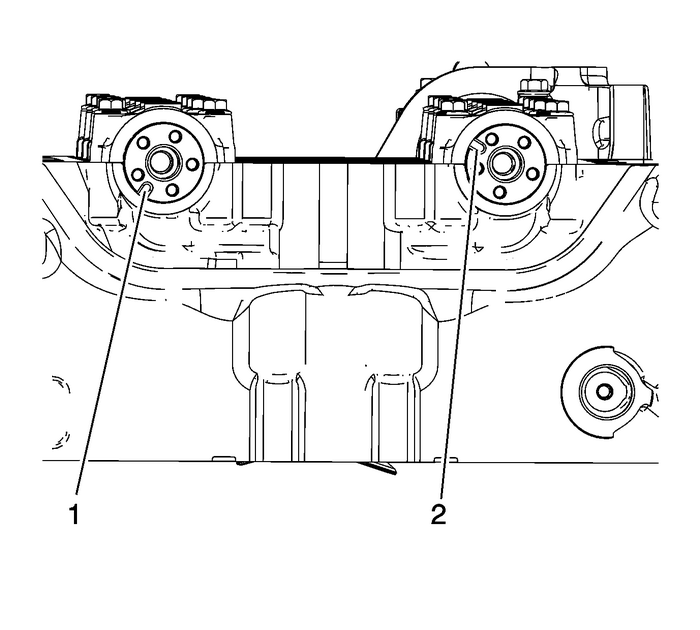 Note:It is critical during installation to ensure the bearing rearcap and cylinder head alignment is correct and the mating surfacesare flush. Ensure that all sealing material has been removed from thecomponents, and the sealing surfaces are clean and free ofcontamination prior to applying the sealer.Install and align the rear cap within 20-minutesof applying the sealer. Note:Apply the sealer to all locations centrally locating the beadon the rail. Run bead to 5.0-mm, dimension a, as shown.Where the cap ends on the perimeter rail, extend beadapproximately 4.0-mm beyond edge of cap.Run bead, dimension c, 32-mm from the edge of thecylinder head as shown.Run beads, dimension b, 20-mm from edge ofcylinder head as shown.Apply a 2.5-mm bead of sealer to the cylinder headat the number 6 intake camshaft rear cap mating surface. Refer toAdhesives, Fluids, Lubricants, and Sealers.Install the number 6 intake camshaft rear cap.Tighten the cap bolts evenly to5-Y (44 lbin).Tighten the cap bolts evenly to10-Y (89 lbin).Back the cap bolts out 120-degrees.Tighten the cap bolts evenly a final pass to10-Y(89-lb-in). Remove all excess sealing material from the fuel pump rollerlifter bore-(1), and ensure the bore is free of debris.Do not allow any excess sealing material to remain within thecylinder head or on any sealing surface.Remove all excess sealing material from the fuel pumpassembly sealing surface-(2). Verify the seal on the cylinder head coverplate-(1) is intact and in good condition.Ensure that the opening plate sealing surface is clean andfree of excess sealing material. Install the rear cylinder headopening plate-(1) and tighten the bolts to10-Y(89-lb-in). Install the intake camshaft position actuator solenoidvalve-(2). 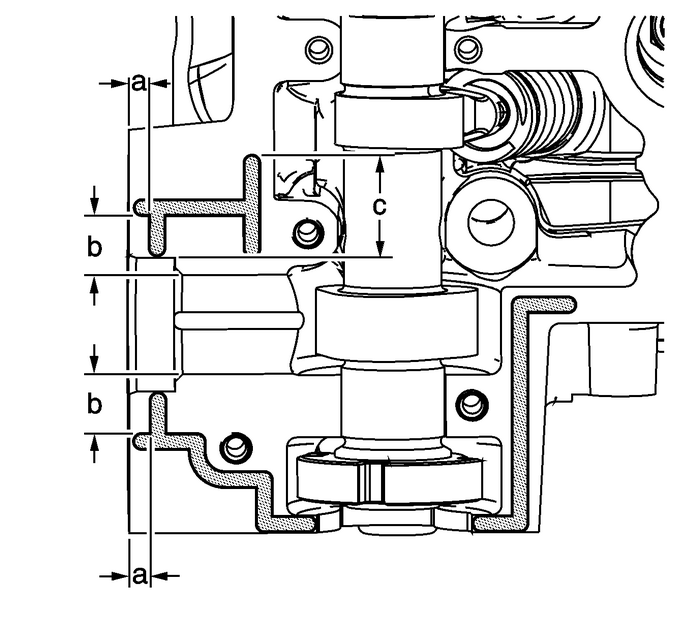 Tighten the solenoid valvebolt-(1) to10-Y(89-lb-in).